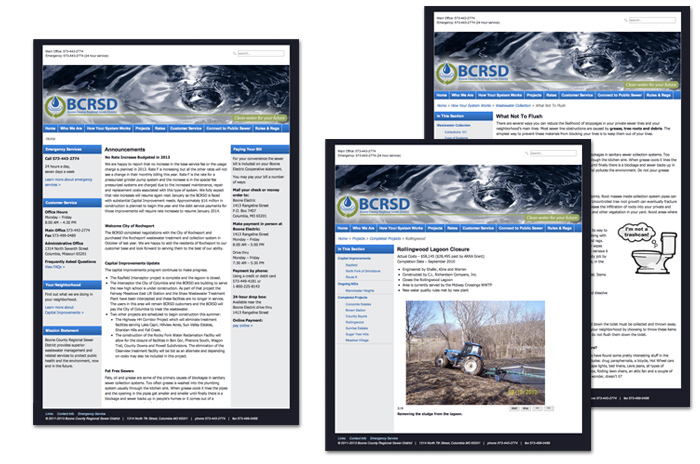 The Boone County Regional Sewer District (BCRSD) needed a website to give their users a friendly, “one-stop” place to find information and district materials. The new website was designed to increased convenience and speed of users obtaining information from the district; and to decrease the customer service calls to the district. The BCRSD staff desired the ability to perform copy and pdf updates themselves on a regular basis. In order to meet this requirement, we built the site in Joomla!, a free, open-source content management system.